Catch sporting event favorites in Des Moines. Iowa high school state tournaments. NASCAR races at the Rusty Wallace-designed Iowa Speedway racetrack. Drawing big names including Danica Patrick, Carl Edwards and Ricky Stenhouse Jr. Dirt track racing at the Sprint Car Capitol of the World, Knoxville Raceway. Runners, bikers, swimmers competing in the Des Moines Triathlon. PGA tour stops at the annual Principal Charity Classic, held in May at Wakonda Club. With notable golfers including Jim Gallagher, Jr., Gil Morgan and Jay Haas. Catch Iowa&apos;s college teams in a head-to-head basketball mashup at the Hy-Vee Classic. 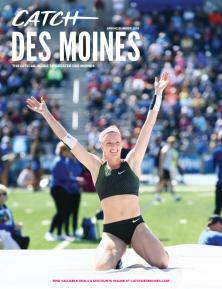 Track stars on Drake&apos;s famed Blue Oval during the annual Drake Relays in Des Moines. Plan your weekend getaway around these fantastic sporting events in Greater Des Moines. Click on the photos below and catch each event&apos;s website for schedules and more information.